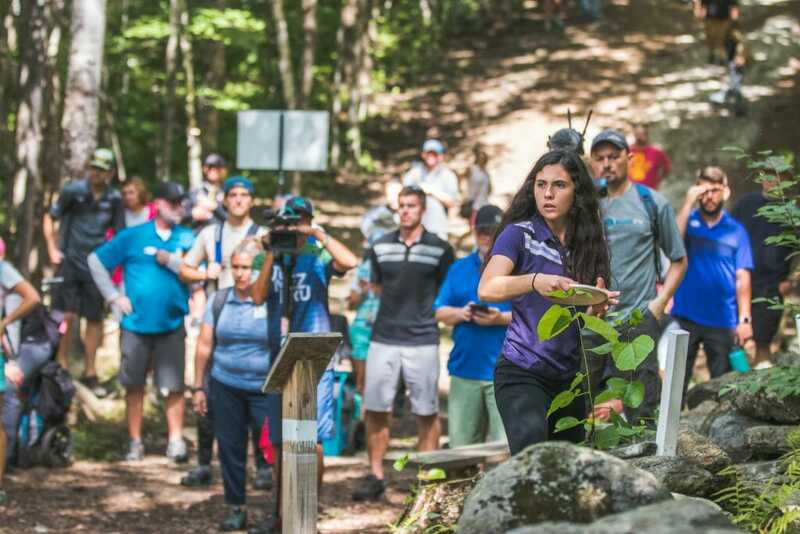 It was a rough round for the FPO division on Brewster Ridge at the PDGA Professional World Championship. The average score was more than a full stroke higher than it was on Wednesday, and it was hard to identify exactly why. Virtually every player at the top of the leaderboard had a tougher playthrough, which meant little change occurred in the standings. Sarah Lamberson, who had been 26-over par through the first two rounds, had the hot round, shooting a 1-under par 60, four strokes better than the next best scores of 3-over par 64s posted by both Kristin Tattar and Sarah Hokom. Otherwise, the struggles were pretty universal, as it was really just a weird, sluggish day on Friday. Paige Bjerkaas couldn’t keep the scoring momentum going from her sparkling round on Thursday. Nor could she match her performance from day one when she posted a 2-over par round on Brewster. But what Bjerkaas did do on Friday was hold onto her lead atop the division. She posted three double bogeys on the round, a score she had yet to record in the tournament. Her 4-over par 65 only cut one stroke into her six stroke lead. Bjerkaas may not have increased her breathing room, but she didn’t let a tough round really cost her either. She is at 1-over par 186 total. Bjerkaas couldn’t quite explain why she struggled more in round three than she did round one on the same course. But Brewster seemed tougher for the whole division the second time around, so she seemed to take it in stride. No, it wasn’t a spectacular round. But with how well Bjerkaas played Fox Run Meadows, all she really needed to do was not totally collapse. She now takes a five stroke lead into two final rounds at a course where she was four strokes better than everyone else. Not a bad place to be. Paige Pierce had a nightmare of a round, shooting 10-over par 71. She slipped on a couple of tee pads, she had putts spit out, and she struggled mightily even when the course wasn’t causing her bad luck. She hits just 28-percent of her fairways and made Circle 1 in regulation just twice. She scored both a double bogey and a triple bogey for the third successive round, and also posted six more bogeys. Pierce had logged several bogeys in each of her two previous rounds. The difference this round was that she couldn’t find any birdies. She shot just one, on the final hole of the round. Pierce is now in fifth place, and 12 strokes back of the lead at 13-over par 198 total. An unofficial rating of 913 would be Pierce’s third worst round of the last year. She was visibly frustrated throughout and after the round, as she could just never get into any sort of rhythm on the course. She’ll surely be glad to move on from Brewster, where she shot 13-over par through two rounds. If there’s a player who can put up the scores necessary to overcome that sort of deficit, it is Pierce. Sarah Hokom put together another unspectacular but steady round on Friday. She was one of just two players to not register anything worse than a bogey on the round, which helped to mitigate her getting only two birdies. But it was also close to being a truly special round for Hokom. She had multiple putts spit out, and if even a couple of those shots had fallen, she would have made a much more serious charge at the lead. Hokom felt pretty good about her round, but did admit that she got a little frustrated with the lack of luck she had with the chains. Hokom is still five strokes back at 6-over par 191 total, but deserves to be a stroke or two better considering the quality of golf she’s played. If she’s able to catch a real hot streak over the next two rounds, she poses a real threat at Bjerkaas’ lead. Kristin Tattar matched Hokoms’ 3-over round which was enough to bump her up to fourth place and a spot on lead card. It’s Tattar’s first tournament in the U.S. this year and she’s grown into it well over three rounds. Tattar is 10 strokes back at 11-over par 196 total, so it would take an ever stronger next couple of rounds to make a real run at a world championship. But she has improved as the tournament has gone on, and has earned her current spot of fourth. It wasn’t a great round for Rebecca Cox, but again, it wasn’t a great round for anyone at the top. She had only two birdies, the same amount of double bogeys she had on the round. Her 6-over par 67 on the day kept her in third place. Cox hasn’t been able to match the consistent play she had on round one, but she’s still quietly hanging around the top of the division. The next couple of rounds are still in play for Cox because she avoided disaster in round three. She was frustrated with her round just like virtually every other player near the top of the leaderboard, but she didn’t shoot herself out of contention and that’s the important thing. Cos is in solo third at 9-over par 194 total. The lead card of Bjerkaas, Hokom, Cox and Tattar tees off at 9:30 am local time on Fox Run Meadows. Smashboxx TV will be livestreaming the round, follow along here at Ultiworld Disc Golf for coverage, and check UDisc Live for up-to-the-minute scoring. Comments on "Bjerkaas Still In Control Of Pro Worlds On Day Three"